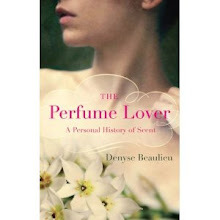 Lovely surprise this weekend: Denise Hamilton, the fragrance reviewer and novelist, sent me a link to her article "'The Perfume Lover,' 'Scent of Triumph' tell heady tales".This reminded me I had a draft for a post on the same topic, which I’d left aside since I haven’t actually read any of the books mentioned. Still, a few observations seemed relevant, so here is it, as a companion piece to Denise’s excellent article. This is shaping up as the year of the perfume book. What’s interesting is that the nature of the genre has shifted from the practical (guides) and straight-up non-fiction (history, popular science, journalism) to narratives. Two of these books are memoirs: mine and Alyssa Harad’s Coming to My Senses: A Story of Perfume,Pleasure and an Unlikely Bride (out in July). One is a historical romance: Jan Moran’s Scent of Triumph. Two more are mysteries: Denise Hamilton’s Damage Control and M.J. Rose’s The Book of Lost Fragrances. In this spate of perfume-driven narratives only one was written by a man and could be classified as “general fiction”: Keith Scribner’s The Oregon Experiment. One of the reasons for this shift may be, at least as far as the two non-fiction books are concerned, that publishers are wary of the subject. Apparently, perfume books don’t sell very well: even Tilar Mazzeo’s The Secret of Chanel N°5 did disappointingly despite its focus on the world’s bestselling juice. 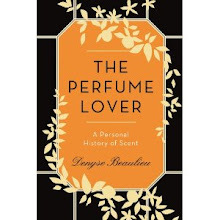 It was only a matter of time before perfume seeped out from straight non-fiction into more diverse literary genres: this diversity is embedded into the various writing strategies of reviewers. The blog and niche brand explosion has increased tremendously knowledge and awareness of the subject over the past seven years. Today, there is more language available to write about perfume than ever. That many of the books featuring perfume, perfumers or perfumistas would belong to the crime novel genre isn’t overly surprising. After all, the sole best-seller about perfume is Patrick Süskind’s novel, which is basically a serial killer story crossed with a philosophical tale. But there’s more to it than that. Perfume and death have been on intimate terms for millennia, and not only because each drop is a killing field of flowers. One of its most ancient uses was embalmment. In fact, the first perfume-related character featured in a blockbuster book is Mary Magdalene, who comes to the sepulcher with myrrh and spices to embalm Jesus. Perfume also carries a whiff of death because it can bring back the past; conjure the presence of the absent. It can work as a clue in a story [i] , but it is also in and of itself an enigma to decipher and therefore, a powerful vehicle for mystery fiction because of its elusive, hard-to-put-into-words nature. Think of it this way: fragrance writing requires a detective’s powers of observation, deduction and pattern-finding. To review a scent, you’ve got to reverse-engineer its plot a la Agatha Christie. Narrative is inbuilt in the very nature of perfume. Because this is what people do when they appropriate a fragrance: they weave its story into their own. More than any other work of art, it is intensely intimate and therefore powerfully emotional, since it literally becomes part of you: on your skin – the last barrier between self and non-self –, but also inside your body since each time you breathe it in you absorb it. 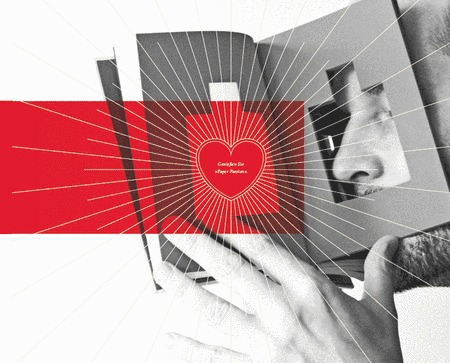 We may devour novels or dive into paintings, but we don’t chemically absorb them. We’re dealing with an aspect of magic here. And magical thinking, as a form of narrative, is at least as old as the first tear of incense burned in the first fire. [i] The perfumer Céline Ellena played on this in the serialised crime novel she wrote for her blog Chroniques Olfactives (in French). Seconding nozknoz's comment - I love this idea too. We all have to make a perfume our own in some way, if we are too love it. Hence, I suppose, our disappointment when a perfume seems to 'wear us' rather than the other way around. Do you recall those old Guerlain ads: 'Are you her type?' They were a direct challenge to the wearer to conform to the type that the perfume house puts out. I have often wondered how successful those ads were. Speaking of success, I am very surpised that Mazzeo's Chanel no 5 book has not performed as expected. I didn't think it was a great book, but you'd expect any book with 'Chanel No 5' on the cover to just walk out the door. Annemarie, I imagine that those old Guerlain ads are based on the once-popular notion that there were perfumes for blondes, brunettes and redheads. There's an old book on the psychology of perfumery that even classifies some aromatic ingredients according to brunette/blonde/redhead bodily odors! As for the Chanel N°5 book, it might be because there were several Chanel books out recently, so that even the staunchest fan would have a bit too much choice. Still, in my own editorial tribulations, it's true the notion that "perfume books are too niche" was often repeated. Oh thanks for clearing up the mystery for me about the Guerlain ads. That makes total sense. So does your point about the Chanel books. I bought Mazzeo and the two Chanel biographies because I'm a nerd, but even I baulked at the one about Chanel having been a Nazi sympathiser. Too much. I agree with your reply to Nozknoz. Everyone's story matters supremely to them, and rightly so. Nicola, I'll be saving the novels for this summer (hopefully at some point I *will* be able to take a break! ), and I'm quite partial to a good crime mystery as well!